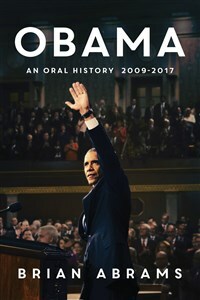 The first ever comprehensive oral history of President Obama’s administration and the complex political machine that created and powered a landmark American presidency. In this candid oral history of a presidential tenure, author Brian Abrams reveals the behind-the-scenes stories that illuminate the eight years of the Obama White House through more than one hundred exclusive interviews. Among those given a voice in this extraordinary account are Obama’s cabinet secretaries; his teams of speechwriters, legal advisers, and campaign strategists; as well as lawmakers on both sides of the aisle who fought for or against his agenda. They recall the early struggles of an idealistic outsider candidate and speak openly about the exacting work that led to cornerstone legislation. They share the failures and dissent that met Obama’s efforts and revisit the paths to his accomplishments. As eyewitnesses to history, their accounts combine to deliver an unfiltered view of Obama’s battle to deliver on his promise of hope and change. This provocative collage of anecdotes, personal reminiscences, and impressions from confidants and critics not only provides an authoritative window into the events that defined an era but also offers the first published account into the making of the forty-fourth president of the United States—one that history will soon not forget. Brian Abrams is the author of three bestselling Kindle Singles oral histories: And NOW . . . An Oral History of Late Night with David Letterman, 1982–1993; Gawker: An Oral History; and Die Hard: An Oral History. Abrams has written for the Washington Post Magazine, Time, and The Lowbrow Reader. He lives in New York City. You can visit www.brianlabrams.com for more information and follow the author on Twitter @BrianAbrams.